I'm sure I'm not the only one that knows this -- ice cream can help you solve many of your Alzheimer's and dementia care problems. Pure and simple, my mother loved ice cream. When I fed my mother breakfast, lunch or dinner I always asked, how is it? How does it taste? Usually she said good or okay. Which bring us to today's topic - ice cream. My mother loved ice cream. Ice cream is the one food where I could ask my mother the question, how is it, and get the same answer every time -- delicious. Every time. My mother would always get her ice cream around 9 PM every evening. She would get a happy look on her face. She seemed very content. This happened even when she was in a bad mood before she got her nightly ice cream. 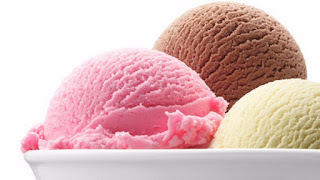 Ice cream is amazing, it can be a mood changer in Alzheimer's caregiving and dementia care. I sometimes used ice cream during the day when Dotty got into a bad or ornery mood. I would think to myself -- maybe I should give her some ice cream. It worked every time. I also used potato chips in the afternoon to perk Dotty up. She loved the "chips" also. Dotty was going to be happy and content after she ate her ice cream. I felt happy too. Relief you might say. If everything went well after the nightly ice cream, I would get Dotty into bed, watch her read her book for a bit, and then she would fall asleep happy. Happy, that was my goal. When you are an Alzheimer's caregiver you learn to take what you can get and enjoy it. If you are having a recurring problem that happens around the same time of day most days, try ice cream. You might be able to change the dynamic and mood, and the ice cream just might eliminate the problem once and for all. It worked for me. I mean it. Try to substitute ice cream for the problem. This was Dotty before she ate her ice cream. And, this was Dotty after she ate her ice cream. The Alzheimer's Reading Room is the number one source of high quality expert information for Alzheimer's care, dementia care, memory care, and for caregivers and dementia professionals.